That’s odd because the rear-wheel-drive layout eats into interior space, making an already tight cabin even tighter, while the longitudinally-mounted inline-6 makes the front of the car longer, which isn’t ideal for city cars. While performance buffs will loathe it, BMW has decided that its next 1-Series Hatchback, shown here in prototype form, will make a switch to the front-wheel-drive UKL platform found in a number of Minis and compact BMWs, including a 1-Series sedan launched in China in late 2016. The new 1-Series Hatchback will be closely related to the 1-Series sedan, though unlike the sedan the hatch will be sold in markets outside of China. Unfortunately, the United States isn’t expected to be one of them. 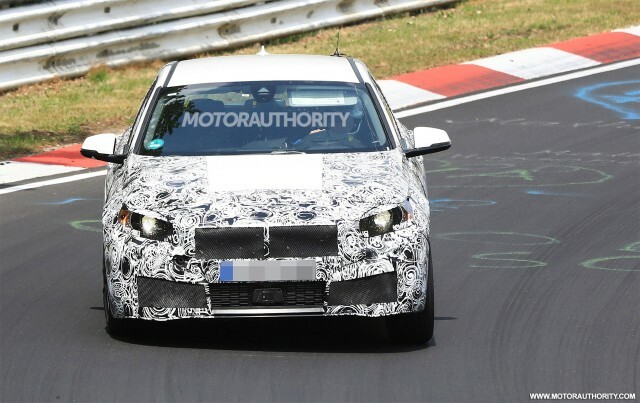 The spy shots and video reveal a more athletic look for the new 1-Series Hatchback. The hood doesn’t appear as long as on the current model since the UKL platform has transverse mounting for engines. And the roof sits lower and slopes more towards the rear. The car also appears wider than the current model. This prototype is for a 5-door model. It’s not clear if BMW will once again offer a 3-door option. We know the UKL platform will also bring some weight savings via lighter materials, helping to aid both performance and economy. All-wheel drive will be available and likely a standard feature on more potent versions. Sadly, we’re unlikely to see one of BMW’s signature inline-6 engine fitted to the car, meaning the range-topper, likely an M Performance model, will come with an inline-4. An inline-3 and plug-in hybrid setup should also be available on the new 1-Series Hatchback. Look for a reveal in late 2018. By then, one of the car’s main rivals, the Mercedes-Benz A-Class, will have just been renewed. Other rivals include the Audi A3 Sportback, Infiniti Q30 and Lexus CT.